Doing a little solo performance for Soulgasm Hawaii on Feb 19th! The last time I was out for this event was DJing their Soul Train Tribute a few years ago. It’ll be great to see/dance with everyone on the island again! See you folks there! 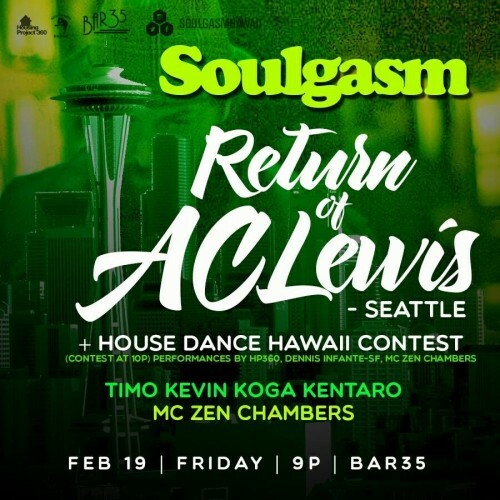 DJs Timo, Kentaro, Kevin Koga alongside our featured guest DJ and Broken breat Producer AC Lewis from Seattle. His love for music started in ’77 with Stevie Wonder on heavy repeat in a household that listened to all kinds of music from The Beatles to Zappa to Disco. Studying percussion, being in bands led him to not only DJ but go on to be part of the well known Sun Tzu Sound. He’s played WMC, DEMF, shared the stage with Afrika Bambaataa, ?uestlove, Bugz in the Attic, Jazzanova, Erykah Badu, Krush, King Britt, Osunlade, Rich Medina, Zero 7, Royksopp, Cinematic Orchestra, Mark Farina. His single, “Tickles” was picked up by Ninja Tune & was also remixed by Domu put out on Tru Thoughts. He’s been adopted by Osunlade and the Yoruba records family & currently a resident at Seattle’s infamous “Stop Biting” Weekly at Lo Fi where he plays everything from Hip Hop to House to Broken Beat and whatever moves him which is what he loves the most. The Premiere Dance event where dancers are given the space to get open & do their thing for up to 2minutes to funky, groovy, soulful bumpin music! In a individual freestyle format, dancers show their abilities in technique, musicality & expression. All entries get a prize and the top score wins cash! To register for contest email us at: soulgasmhawaii@gmail.com. The deadline is FEBRUARY 15th.